On September 22, 1942, a U. S. Army B-25C bomber, (41-13098), left Presque Isle Maine Army Air Base en-route to overseas duty in England when it crashed in the nearby town of Fort Fairfield, Maine, off Fort Fairfield, Road. All seven crewmen aboard were killed. The plane was said to be flying in poor visibility conditions. Civilian witnesses stated they saw the aircraft burst into flames while still in the air. S/Sgt. William H. Finch, 35. Buried in Fairview Cemetery, Fairview, Michigan. S/Sgt. Billy John Hill, 22. Buried in Nocona Cemetery, Nocona, Texas. S/Sgt. Lawrence A. Robinson, 26. Buried in Pine grove cemetery, Marlborough, N.H. 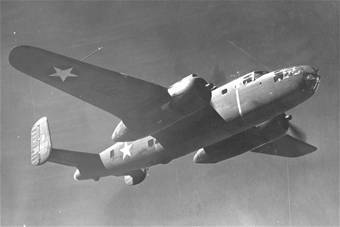 Both aircraft were part of the 379th Bomb Squadron, 310th Bomb Group, then based in Greenville, South Carolina.